Summary: This walk of the Langdale Pikes from Old Dungeon Ghyll to the familiar tops of Pike Of Stickle and Harrison Stickle and then Thunacar Knott, High Raise, Sergeant Man, Tarn Crag and Blea Crag is a well trodden classic. 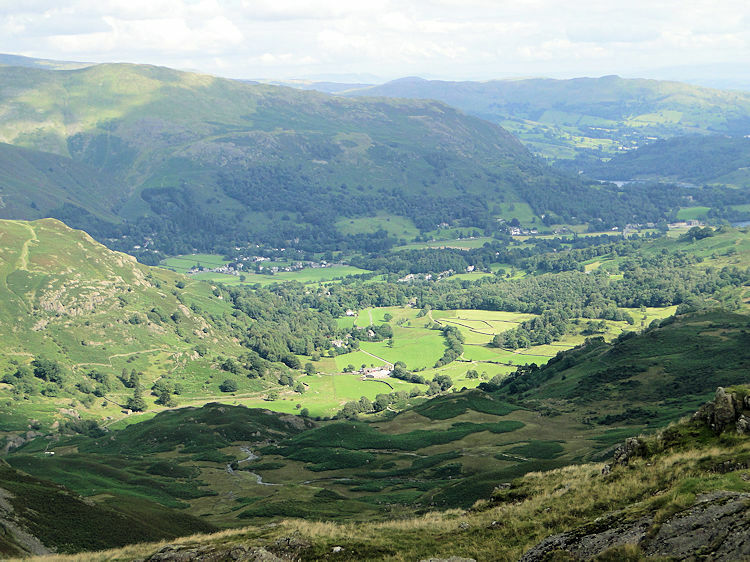 Altogether a total of eight of Wainwright's fells are completed in this fabulous circuit of the Langdale Fells. I wish to refer to Alfred Wainwright's description of the Langdale Pikes before my story begins. It is so appropriate to the pleasure of this walk and the delights that were ahead of us. "No mountain profile arrests and excites the attention more than that of the Langdale Pikes and no mountain group better illustrates the dramatic appeal of a sudden rising of the vertical from the horizontal; the full height from valley to summit is revealed at a glance in one simple abrupt upsurge to all travellers on the distant shore of Windermere and, more intimately, on the beautiful approach along Great Langdale. Nor is the appeal visual only: that steep ladder to heaven stirs the imagination, and even the emotions, and this is especially so whenever the towering peaks come into view suddenly and unexpectedly.." With such a description how could I not make this walk the first in the Boys 2nd Annual Lakeland adventure, The boys being Dave, Steve, Chris and Rick and me, our first adventure being on the previous year. Four days walking to look forward to in the Lake District, four days out in one of my favourite walking areas and all in the company of my walking chums. It was great, so exciting and something I had been looking forward to for weeks. 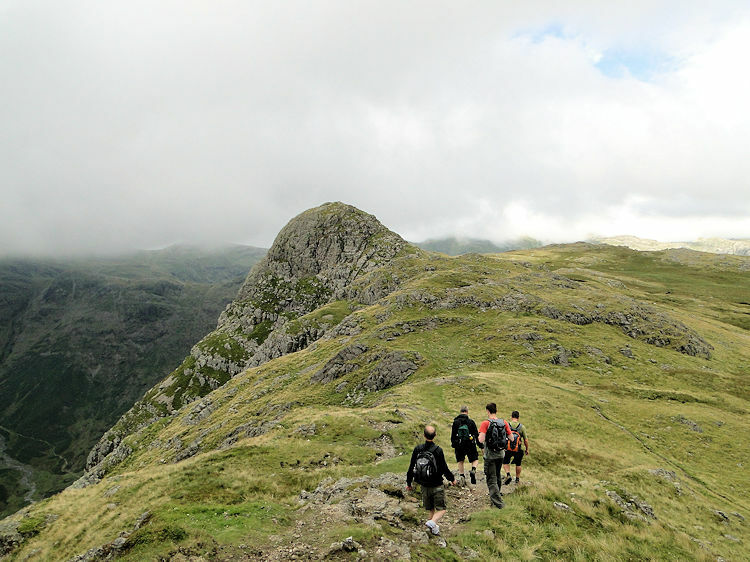 And now we were off, and what a start it was, to finally climb to the top of the iconic Langdale Pikes. I thought back to a time some years previously when Steve and I were doing a low level walk around Elterwater. On that occasion I looked up in awe at the distinctive Langdale Pikes wondering when I would eventually get round to completing them. Now was the time and we were blessed with wonderful weather to help us up to the heights of the Langdale Pikes over 500 metres higher than our starting point at Old Dungeon Ghyll. As per usual we took a few wrong turns in trying to get out of the car park but once on the right path the GPS took over and we strode out onto the fells by first heading to Mark Gate, a steep section of considerable effort which was a little intruded on by a family with children who were throwing small rocks indiscriminately. I scowled at the youngest when one he launched rolled down close to where Dave and I were taking a breather. Fortunately the family slowed and we passed to further enjoy a more peaceful ascent to Mark Gate at which point a cloud skirted Pike Of Stickle came into view, it's dome top encouraging us on. I often stopped to take photographs and catch my breath trailing about one hundred metres behind Steve, Chris, Rick and Dave. I also wanted to make sure the clouds that were on the rise during our ascent cleared the Pikes before we were climbing to the tops of them. It was not long before the hard work was done and the ground became less steep for a while before a final surge up to Loft Crag where we took a short break to a) catch the view and b) take a drinks break. It had been hard work. 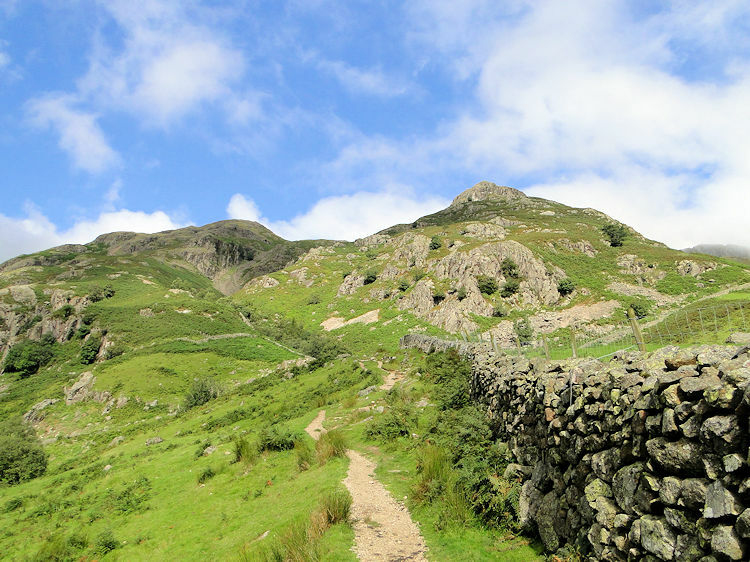 The exhilaration of climbing over 500 metres, more than half of today's stupendous walk was exaggerated by the sight of the famous Langdale Pikes at such close quarters. Pike of Stickle and Harrison Stickle were easy to identify but as for Loft Crag that took us some time. 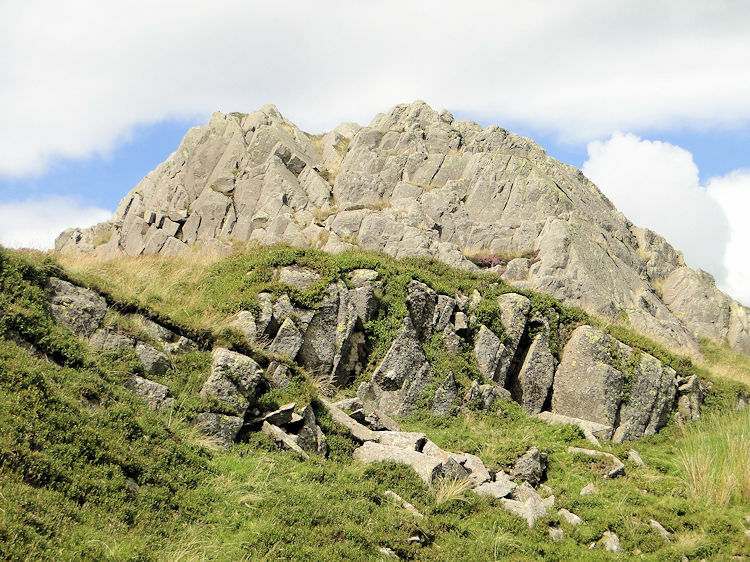 Lower than the two Stickle's, Loft Crag could have been one of two craggy outcrops and fortunately for us we climbed them both for the one we first thought was Loft Crag was actually an unnamed hump of rock just to the right of our ascent path. Loft Crag was actually on our left towards Pike of Stickle, a crag requiring a 20-30 metre ascent to get to the top which we did as a short detoured pitch on our walk to the base of the conical Pike of Stickle. 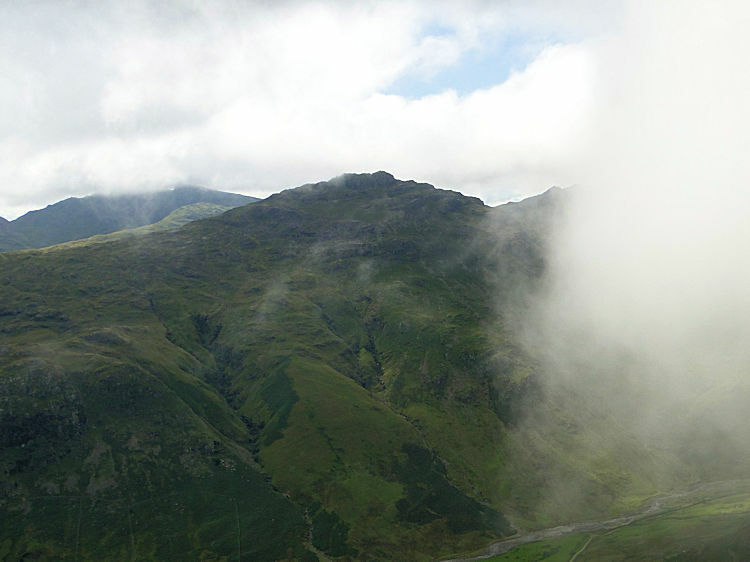 Loft Crag was a delightful quick capture and from the top the majesty of Pike of Stickle became more apparent. 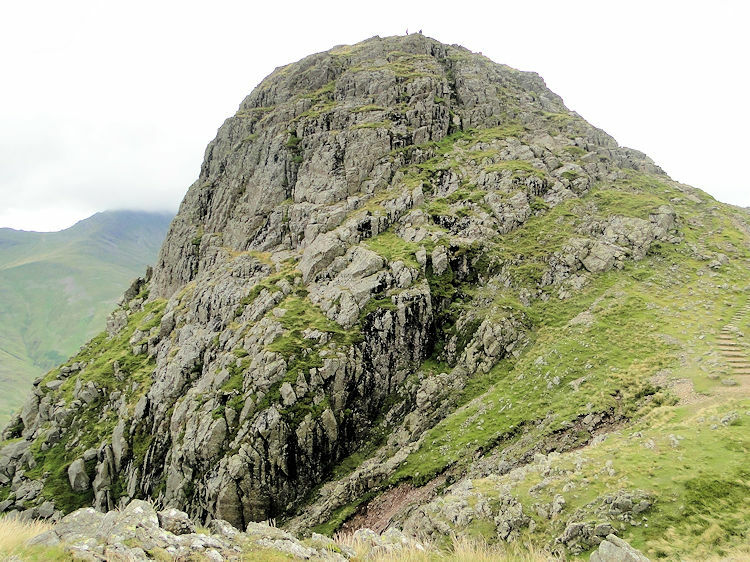 The cone appears symmetrical from afar but now we were so close the steep fall of the western face to Stickle Breast was clear to see, a drop into a chasm which clearly needed to be avoided. 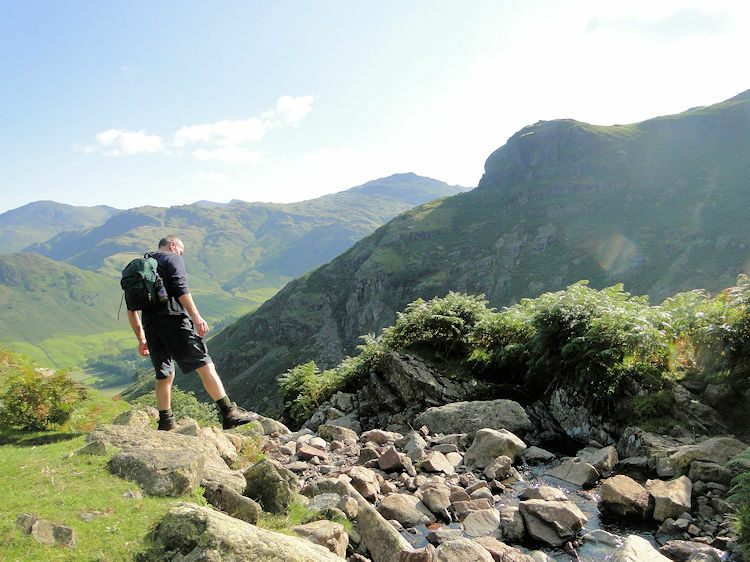 As Wainwright described it "The unbroken sweep of Stickle Breast above Mickleden is one of the most continuous steep slopes in the district, rising nearly 2,000 feet over a lateral distance of half a mile" We did not want to be going down there! Thus we kept our ascent simple following a clear path, steep and rocky at times, to the top from where we took in more views of the peaks around. Standing on top of Pike of Stickle was like standing on top of the world. Wainwright sums up this mountain top very well. First he describes the characteristics "The summit is the perfect dome suggested by its appearance from a distance, being circular in plan and bell-shaped" He then describes the view from the summit "The view is extensive, especially to the north, although it is interrupted in other directions by nearby high ground. But the best thing to be seen is below the skyline; the head of Mickleden far beneath, with Bowfell a magnificent object as a background to the picture" I did not look that way for my eyes were fixed on Harrison Stickle, my next object of desire and so in the company of my walking pals we scampered down off the dome top and down to track due east and on to Harrison Stickle. Once we had climbed onto a suitable rock shelf which afforded wind shelter we settled for lunch. 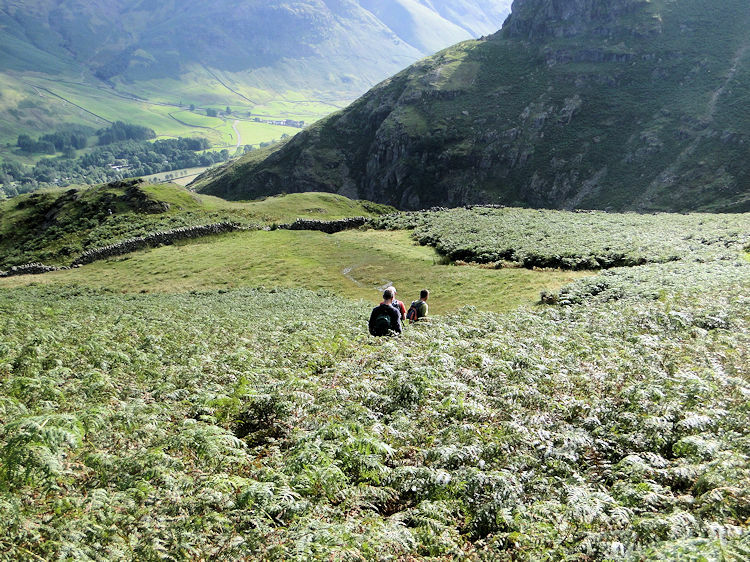 The three premier Langdale Pikes had now been accomplished and we had deserved it. During lunch we talked with a delightful couple from Lancashire who loved the Lake District so much they travelled up to walk most weekends. They were an inspiration, probably in their 60's but with youthful enthusiasm. We talked of the wildlife in the Lakes particularly birds and while they lamented about the demise of the local Golden Eagle's they were thrilled by the numbers of Buzzards, Ospreys and even some Red Kites seen in the Lakes in recent times. It was one of those wonderful lunch moments taken on the mountains. From Harrison Stickle we took a north course to Thunacar Knott and during the easy walk I thought of the last time I was on Thunacar Knott with Deke and Spud just after I has climbed Pavey Ark via Jack's Rake for the 2nd time. Both times had been with Deke and Spud and were special walks. Deke's ashes are scattered in the midst of Thunacar Knott and Pavey Ark so I thought as I walked "Thanks mate, thanks a million being there and the special thrill you gave me by guiding me up Jack's Rake. It was a life changing moment" I have a feeling I will get Steve to join me on Jack's Rake one day in the future as a further tribute to the great man. Leaving Deke's warm soul behind we all walked from Thunacar Knott to High Raise and I was now bounding along. The walking was fairly flat and the views to the Crinkles, Bowfell, Scafells and Great Gable in the south west were astounding. It was a clear day and a glorious sight. 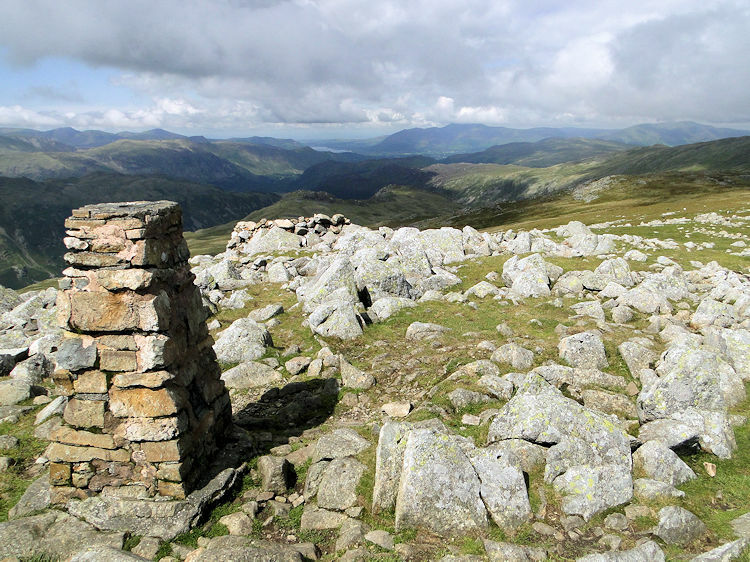 At the summit cairn views were also extensive all round and in particular those of the Skiddaw range due north. Of interest to a Yorkshireman is the view east/ south east to the Pennines and even the distinct flat top of Ingleborough. Wainwright afforded four pages of his pictorial guides to the view from here, one of the most satisfying in all of England. High Raise is a must visit but only on a clear day for the mountain itself is featureless. It is the views it affords which are sublime. From High Raise we pressed on to Sergeant Man which was our 6th Wainwright Fell of the day and typically described by the Lancashire lady we had lunched with as 'a small knob' Even Wainwright called it 'merely a rocky excrescence'. 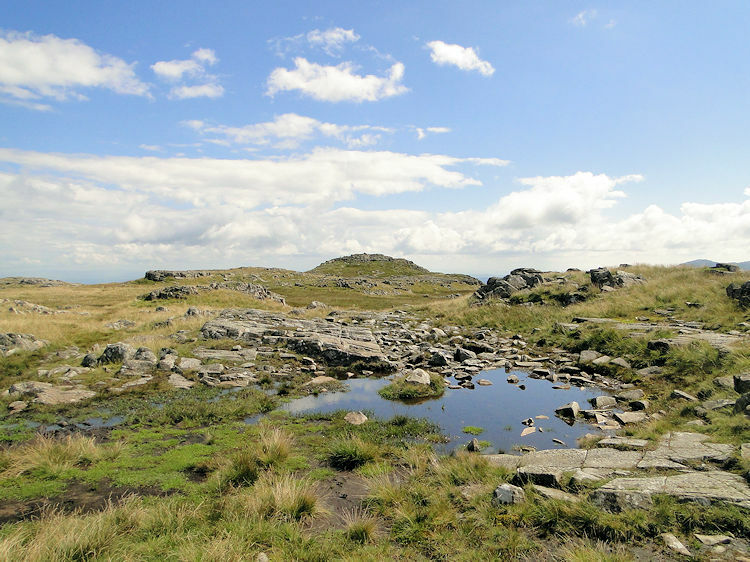 The path from High Raise to Sergeant Man was another amble over level ground with a final wet section of tiny tarns and bog protecting the rocky outcrop. Once we reached the rock it was a short bound to the top and although the man itself is small the interesting shapes made it another spot for reflection and for contemplating the rest of the walk. The walking had been fantastic on and around the well known Langdale Pikes but for me there was more excitement yet to come. Two more Wainwright's were still outstanding and as my GPS battery had given up some time earlier (I had forgotten to charge it up overnight!) I had to plot the route to the next target which was Tarn Crag by traditional navigational means. So with map and compass I plotted a beeline route north by north east and stuck to it. There was no path to follow, this was pure exploration, so much so that Chris oft referred to his back up GPS and with Steve, Rick and Dave plotted a different course. I was sure my navigation was correct so walked on over ground without any clear paths and often set by doubt I stuck to the plot and forged on eventually to reach Lang Crag which was indicated on the map, a reassurance if ever one was needed. 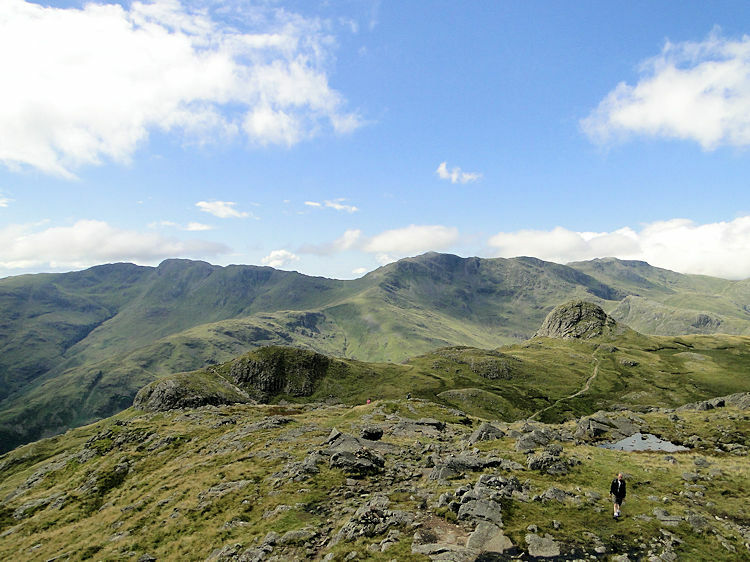 I climbed to the top of Lang Crag and saw the boys come into view about half a kilometer in the distance. Both methods had worked, my direct route and Chris's meandering GPS plot which was my original route plan. Then all of a sudden my joy turned to despair, I had lost my GPS! On the walk across from Sergeant Man I had tried switching it on and did get a short confirm before the battery packed up again. I knew where I had done that but first I checked my scrambled route up and down Lang Crag to see if it had dropped out of its case then. No it hadn't but while I had been looking Steve had tracked over to me and as I approached him he picked it up from the ground at the base of Lang Crag. I had dropped it while taking my camera out to take the picture of Lang Crag which you can see in the table above this section of the report. I had dropped it at my feet right there!! I was indebted to Steve for rescuing my GPS, I will always make sure the unit is firmly in its case from now on and never drop it again. Panic over we continued the walk from Lang Crag to Tarn Crag which was always indistinct from our southern approach but which unveiled exceptional views to Easedale and the Valley of Grasmere. Sun pierced the clouds to bathe the valley in sunshine as we stood on the crag and looked down from our lofty perch. Time was pressing on so we reluctantly ceded the view and made our way from Tarn Crag to the flank the southern edge of Codale Tarn before scampering up onto Belle Knotts. Steve was first up and said "You're not going to like what you see from here" and sure enough we were faced with a short descent to a track intersecting Easedale and Stickle Tarn before ascending to Blea Crag via Eagle Crag. That was a bit of a bummer as the profile showed a level traverse. 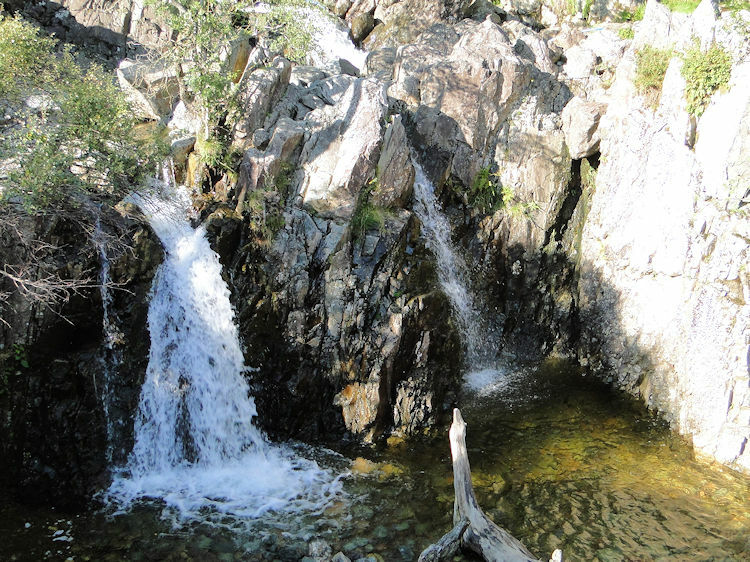 What we should have done is stay higher above the north west edge of Codale Tarn but alas we did not. Stuck with our dilemma Dave decided to follow the path down past Easedale Tarn and into Grasmere village. He was not collecting Wainwright's a fancied a nice walk along the track taking in lovely views and features such as tarns and waterfalls to Grasmere. He went off and got his wish. 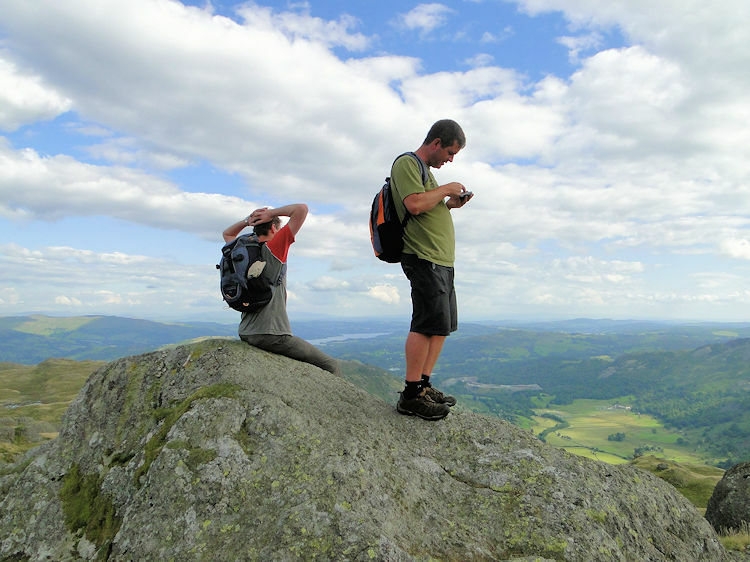 We soldier up the edge of Eagle Crag, a tough haul after an already long day but it did not take too long to claim the 80 metres height in 300 metres of distance before following a level line for another 400 metres to reach Blea Crag. Eight Wainwright's completed and seven new ones so I was particularly ecstatic during our final rest on the top before making our way back to Langdale. 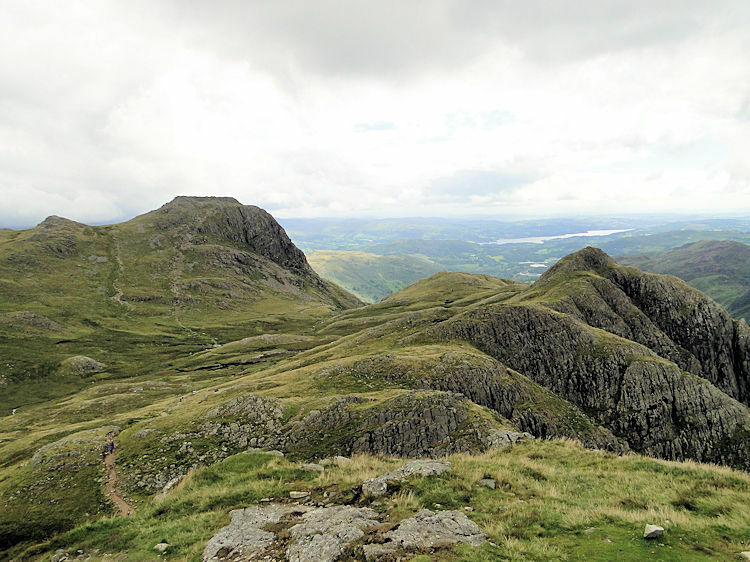 While looking down in the direction of Langdale from Blea Crag, Steve had spotted two walkers making their way in a similar direction and so we all agreed to follow a course towards them. 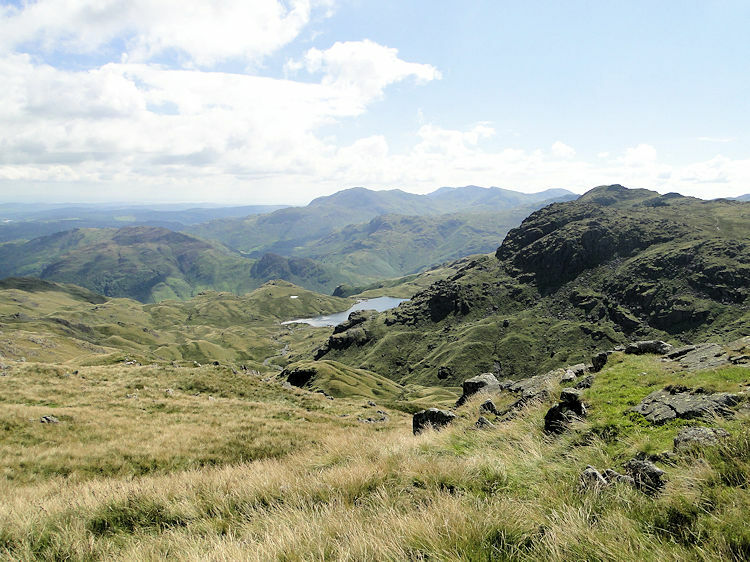 At first the going was easy, a gentle descent and often picturesque with staggering views of Pavey Ark straight ahead. 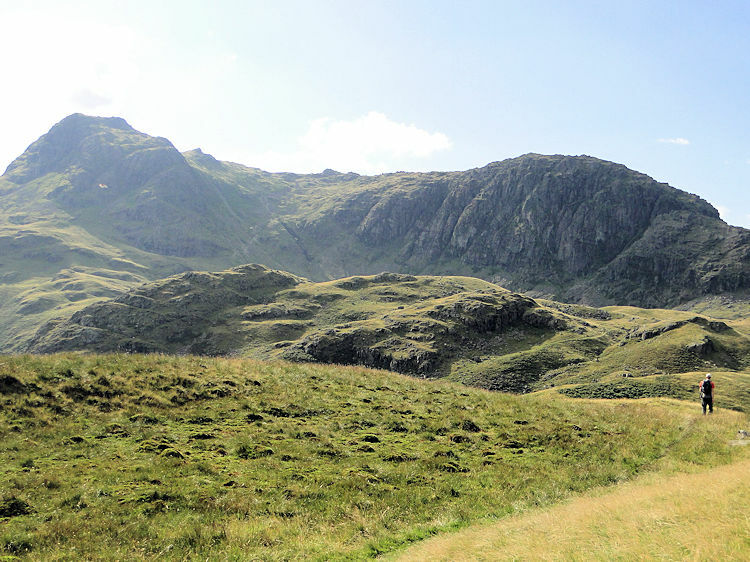 As always when I look to Pavey Ark's south east face I was drawn to the cut of Jack's Rake. It always strikes me with awe and looks so precarious that I still wonder how I have managed to overcome it. Views to the left of Pavey Ark provided a wonderful picture of the drop into Langdale and our starting point but we still had work to do to reach home. Eventually the descent became steeper and soon drops were in front of us which left us with decisions to make. as we stood making one such choice Steve suddenly disappeared as his feet went from beneath him and he actually slid a few yards before arresting his unintended descent. After the comical moment which could have been worse we forged on down and soon came across an enclosure full of ferns which were effectively a barrier to easier ground beyond. With no option but to walk through the enclosure we toughed our way through the waist high ferns. Once through the walking was easier again. We still had a little navigation work to do but Steve spotted a suitable crossing of Stickle Ghyll just above Miller Crag and from there on we enjoyed a pleasurable if fatigued walk down the man made boulder paths with plenty of interludes while pausing for waterfall views or simply enjoying the beauty of the Langdale countryside. After stepping down for 500 metres and over 500 steps we were off the fell and on to a short section of lush grass from where we walked past the Old Dungeon Ghyll pub with people massed in the garden. Beer was for us later but for now it was back to the car, directly through the car park this time to change and collect Dave in Grasmere. This walk was a fantastic walk in the company of my walking friends and will live forever in my memory, a true classic.